Sunday's cold and rain called for a make-your-house-smell-incredible braise. I had a package of short ribs which I had purchased from a nearby Bestway Supermarket. They're cheap and great for braising. Over time, they become incredibly tender and fall of the bone. With an ale and just a few other staple ingredients, I made this dish. This recipe is adapted from Dave Lieberman's "Braised Hoisin Beer Short Ribs With Creamy Mashed Yukons And Snow Peas". 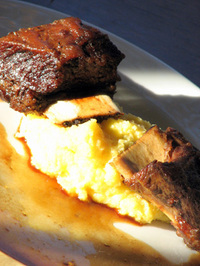 Here, I serve the short ribs over Keswick Creamery Cheddar polenta. Salt and pepper ribs on all sides. In a heavy bottom pan, add vegetable oil and heat until you see a wisp of smoke. Add short ribs (in batches if necessary) and brown on all sides. Remove ribs to plate. Pour off all but one tablespoon of rendered fat. Return pan to stove and place over medium heat. Add garlic and ginger and sauté for 3 minutes. Add ribs to pan. Add beer and vinegar to pan and cover. Simmer for 2- 2 1/2 hours until tender. Add hoisin sauce to pan and transfer pan to a preheated 300 degree oven. Cover and allow to cook for an additional 30 minutes. Remove ribs from pan and strain fat from braising liquid ( I poured the liquid into a fat separator). Serve over prepared polenta which has been mixed with 1 cup of shredded cheddar cheese. Serve with braising liquid on the side, or poured over polenta and ribs. *ginger stores well in the freezer. I buy a hand sized knob and store it in the freezer in a zip-loc baggie. To use, you simply break a piece off and grate it. To slice, allow it to defrost a bit. You can peel it frozen too, but truth be told, I skip this step from time to time, especially if I'm grating it.